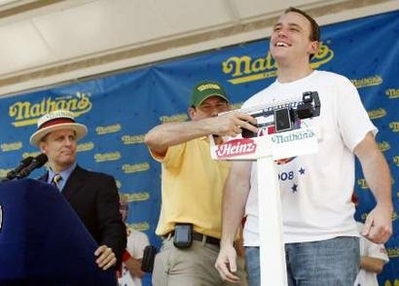 This may be the worst moment ever for the “sport” of competitive eating. 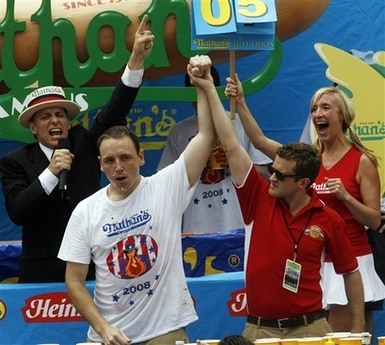 World champion Joey Chestnut was not only beaten in a beer chugging contest, but he LOST TO A BLOGGER! 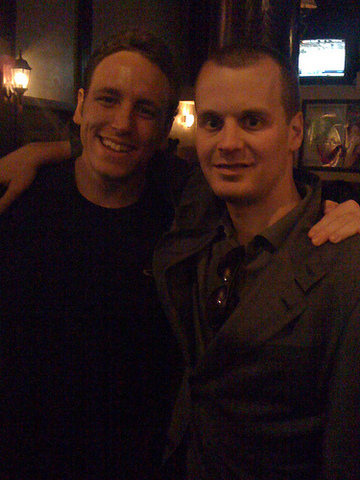 Chestnut was outchugged by Dewey Hammond from yardbarker.com. 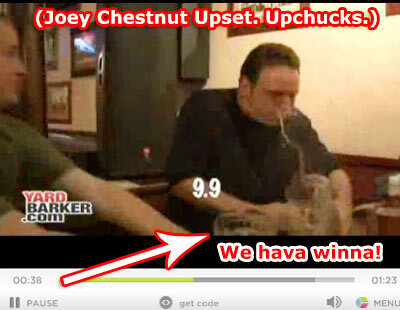 Not only did he suffer the humiliating loss, but Chestnut spewed as you can see from this still captured from the yardbarker video by SPORTSbyBROOKS. 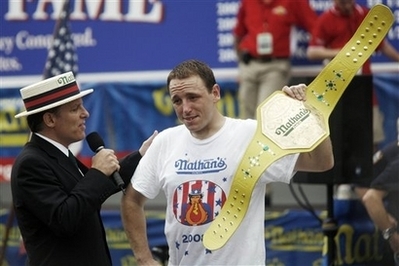 In an epic July 4th battle, American competitive eater Joey Chestnut defeated Kobayashi in the Nathan’s hot dog eating contest at Coney Island. 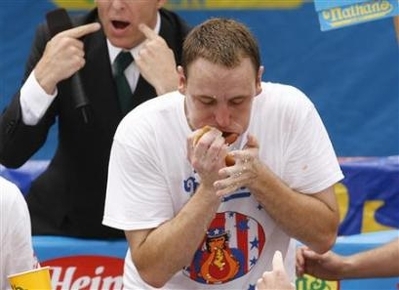 Chestnut had to go overtime to win the grueling mouth-to-mouth competition. 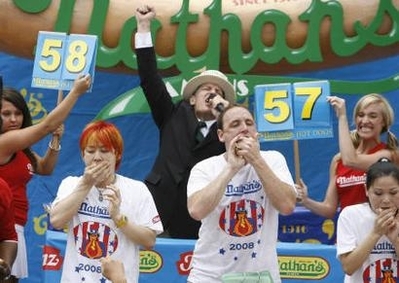 The two were tied at the end of regulation, both having devoured 59 hot dogs in ten minutes. 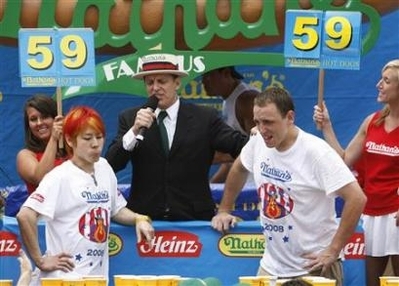 Kobayashi (a six time winner of the Nathan’s event) took the early lead by stuffing down 10 dogs in the first minute but was caught by Chestnut down the stretch. 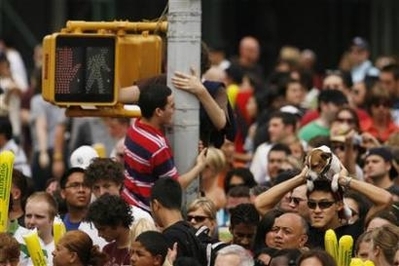 25,000 people jammed the streets of Brooklyn to watch the event. 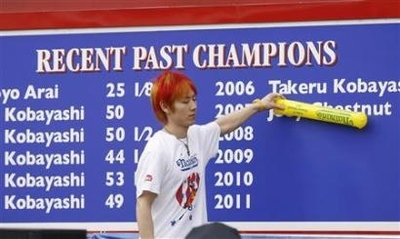 Chestnut dominated Kobayashi in the overtime eat-off winning the coveted Yellow Mustard Belt. 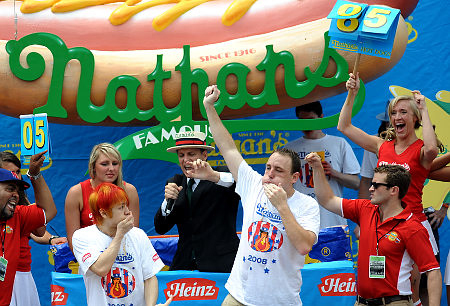 Every year on July 4th they hold the Super Bowl of competitive eating-the Nathan’s Famous Hot Dog Eating Contest. 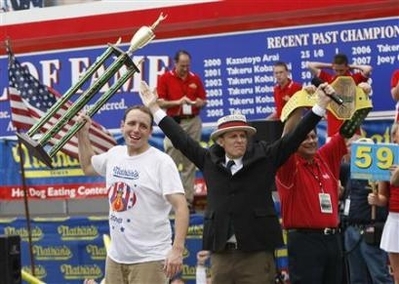 The “sport” of competitive eating has become so big that the annual New York event is broadcast live on ESPN. 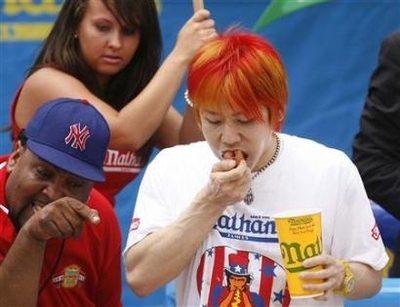 The all-time biggest name in competitive eating is Takeru Kobayashi of Japan. 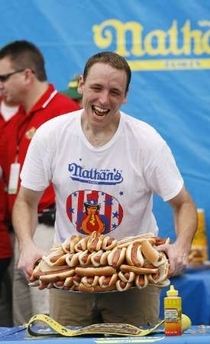 He is a six-time winner of the Nathan’s event. 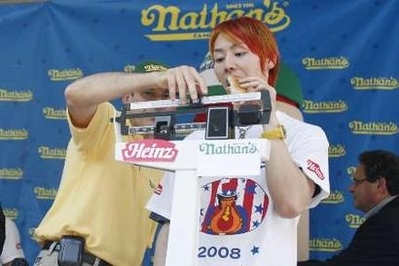 Kobayashi had held the all-time record by downing 63 Nathan’s hot dogs. 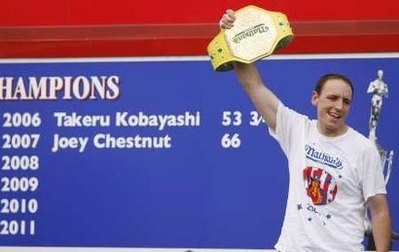 Last year Kobayashi lost in heated battle to American competitive eater Joey Chestnut. 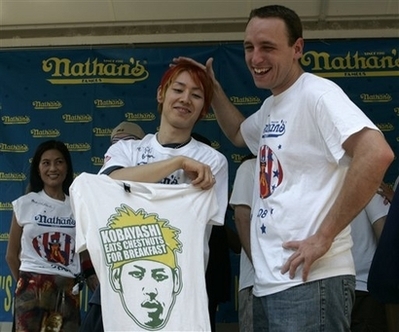 Chestnut broke Kobayashi’s record by eating 66 hot dogs. 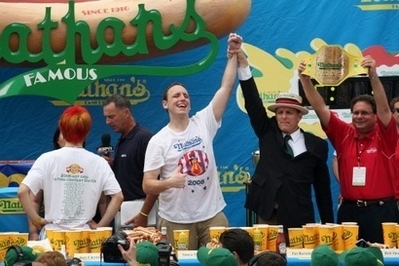 The world has been waiting breathlessly for the rematch at this year’s July 4th event. Unfortunately, there was a problem. 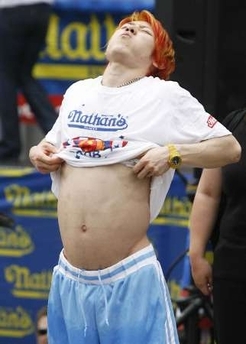 Kobayashi didn’t qualify for the Nathan’s contest. Only last year’s winner is granted an automatic exemption. 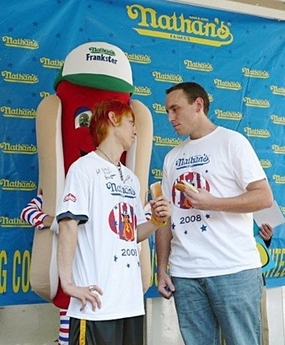 Kobayashi failed to win a regional hot dog eating competitition to qualify. 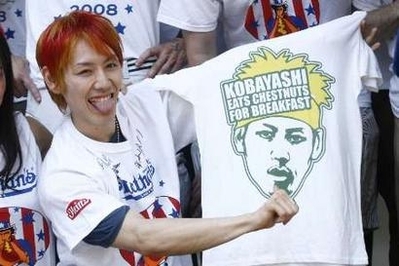 Panicking, the commissioner of MLE (Major League Eating) decided to award Kobayashi a spot in this year’s championship by awarding him a “sponsor’s exemption.” Sponsor exemptions are common in sports like golf and tennis. 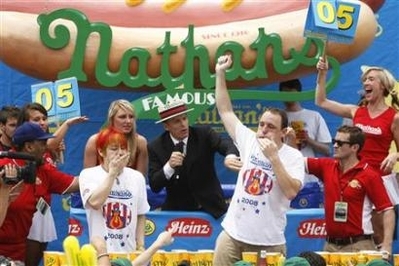 They had never been used before in competitive eating. The commish defended his decision to grant the exemption by actually comparing Kobayashi to Tiger Woods. After all, he said, Tiger Woods doesn’t have to qualify for every golf tournament. 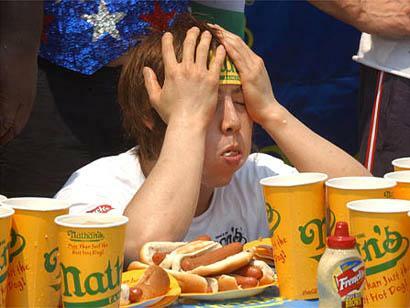 You are currently browsing the archives for the competitive eating category.